Should you require or request a BT engineer visit it is important for you to be aware of potential charges. Until an engineer has been to your premises and can confirm the cause of the fault we are unable to confirm whether or not you will be charged (The only exception to this is if you are informed of a guaranteed charge before booking the appointment). However, if the fault is found to be outside the boundaries of your premises, there will be no charge. This charge will be £129.99 and will be charged within the 4th TalkTalk bill of the engineers visit. Phone problems can occur for any one of several reasons, such as other equipment in your home interfering with the signal. If you are unable to make any outbound calls and you do not have a dial tone, there are some handy tips in our How to get a dial tone video. Check if all phones in the house have the same problem and also that none of your phones are off the hook. Check that all your connections are fitted securely and none are loose. If possible do not use a wireless phone, but one where the handset is connected with a cable. Unplug all the phones in the house except the one that is connected to the master phone socket. Also unplug any other connections to your phone sockets, such as Sky digital or a broadband router. If you can get a dial tone with just one phone plugged into the master socket, it may be that another piece of equipment is faulty. Connect all of your other phones and devices one at a time and check each time that you get a dial tone. If the dial tone goes away again, unplug the last piece you plugged in as it will probably be that device or connection that is causing the issue. 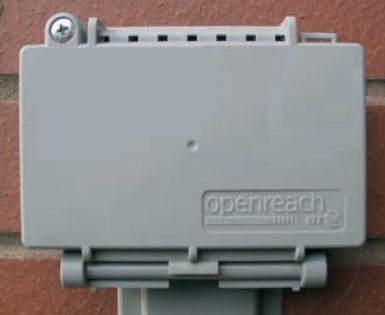 Note: If you have broadband please ensure you have a microfilter connected directly to each phone socket in your home. If you are using wireless handsets, check that the batteries are charged and make sure that you are close to the main base station. If possible, connect a different phone, that you know is working, directly to the master socket with nothing else connected to any other phone point in the house. If you still have no dial tone please contact us and we will get our engineers to check the issue and resolve any fault that there may be with your line. Unplug all the phones in the house except the one that is connected to the master phone socket. Also unplug any other connections to your phone sockets, such as a Sky box or a broadband router. If you are still unable to make calls please carry on with the following steps. To check where the fault may be, you need to see if you can make a call over a different network. From the same phone, try to dial the same number you are calling, but dial 1280 before the number. * This routes the call over the BT network instead of the TalkTalk network. If the call still does not connect, and you pay your line rental to TalkTalk, please contact us so that our engineers can investigate and resolve the problem for you. If you pay your line rental to another company, you will need to contact them. If the call did connect when you used the 1280 before the number, but you still can not connect without using that code, please carry on with the final step below. The final test is to try the number again, but this time dialling 1840 before the number you are calling. If the call still does not connect, please call Customer Services on 0870 444 1820^ where we will investigate and resolve your problem. * If this call connects you may be charged directly from BT for it. ^ This call is free of charge if made from a TalkTalk phone line, but may not be from other providers or mobiles. Occasionally you may experience a problem using your TalkTalk service - whilst we are doing our utmost to make sure you don't experience a fault by making sure we are using the best service providers and networks to carry your calls, there are times when you may experience difficulty in either making or receiving calls. Please read the advice below and the frequently asked questions received from our TalkTalk customers. If you're experiencing difficulty with your TalkTalk landline, there are a few simple checks you can carry out before calling us. These can not only help us identify the problem for you, but may even help you to solve the problem yourself. Is your line rental with TalkTalk? Unplug all devices from your main BT phone socket, including any microfilters. If your main BT point looks like the one below, you can follow the instructions under the picture. If it doesn't, do not try the steps below and Contact Us. Remove the bottom part of the socket by unscrewing the 2 screws. Gently ease away the bottom part of the box; please be careful. Once removed, you will see a test point in the bottom right hand corner. Try connecting a corded phone into this point. If you are now able to make a call, the fault is with the extension wiring or a piece of your telephone equipment. You can try to locate the fault yourself or you can call us to arrange an engineer's visit. Please be aware, there will be a charge for this service. See our Broadband Terms & Conditions for details. If there is still a problem with your test socket, or your phone does not have a test socket or does not look like the picture above, then please call our Faults Team on 0870 087 8777 orContact Us, where our advisors will be more than happy to help you. (TalkTalk customers will not be charged for calls to this number. Call costs from other providers may vary. Lines are open: Monday to Friday 8am to 8pm, Saturdays 9am to 6pm and Sundays and bank holidays 10am to 5pm.) If we arrange an engineer visit and the engineer finds a fault with your equipmment, or if they think the fault has been caused by you, TalkTalk will charge you for the visit. Your phone might not be ringing for any one of several reasons. To fix the problem, work through the following steps. After trying each step, check to see if the problem has been resolved. If not, then try the next step listed. If there is a service outage or network problems, this might cause noise on your phone line. To check for problems that might be disrupting your service, please visit Service outages. There you'll find a list of the most recent problems that we've been notified about. Check that the batteries are fully charged. If they are running low, you may experience noise on the line. More than one cordless phone in your home might cause interference. Try disconnecting one to see if the noise stops. Check your phone's user manual to see if the phone is picking up noise via radio waves. The ringer is usually found on the base of your phone. It is normally a small, sliding switch that can be set to Hi, Lo or Off. Please ensure that it is set to Hi. If you're unsure how to check the volume levels, please refer to the user manual. If you have BT Call Minder, check that the number of rings is set to more than one. For details on how to do this, see Call Minder. If Call Barring is set up on your phone line, some in-coming calls may be blocked. For details on how to check this, see Last Caller Barring. Check that none of your phones are off the hook and that all cables and connections are plugged in securely. If the problem occurs only on a specific phone, it's likely that there is a problem with the phone itself, or with the wiring to the socket where you experienced the problem. If you have more than four phones or other telephony devices connected to your phone line, you may experience problems. Each device that's connected to your phone line has a value assigned to it called a REN value. Your phone line can have a maximum of four REN in use at any one time. Most phones and faxes have a REN of one, although some older pieces of equipment can have a higher REN value. If you have several devices connected to your line and they exceed the maximum limit of four REN, there's a possibility that your phone will not ring. To check if this is the problem, unplug all your telephony equipment from the phone line. If you have broadband, don't forget to unplug all microfilters and your modem or router. Plug everything back in, one by one, calling your landline after each one to check if it will ring or not. This will help you to locate which device, if any, exceeds your REN limit. Unplug all telephony equipment from your phone line. This includes telephones, faxes, modems, Sky Digital, extension leads, adapters, phone splitters and so on. Note: If you have broadband, don't forget to unplug all microfilters and your modem or router. Plug a telephone (preferably a corded phone) into your master phone socket and check if the problem still occurs. Plug one piece of equipment back in. Call your phone to see if it rings. If it rings, then that piece of equipment is fine. Plug in another item and check again. If you find that your phone stops ringing at any point, then the last piece of equipment you connected may be the source of the fault. Unplug this piece of equipment and keep it unplugged. Please refer to the user manual of the faulty item or contact the supplier for help. Important: This step is for advanced users only. Locate your master phone socket. 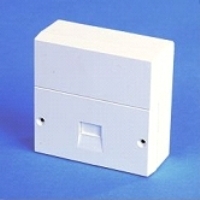 The master socket consists of two parts, with two screws on either side of the bottom half. Carefully unscrew the two small screws and pull out the bottom half of the faceplate. Note: If your main phone socket does not have two parts across the front, as shown in the picture above, do not unscrew the faceplate, as this is not the master phone socket. If you can't locate your master socket, please contact us for further assistance. You'll see a test socket on the right-hand side. This socket connects you directly to the phone line and bypasses any extension wiring you may have. Connect a micro-filter to the test socket, and plug a telephone (preferably corded) into the phone side of the filter. Make a phone call and see if the problem reoccurs. If your phone rings at the test socket, it's likely that your internal wiring is faulty. You can either repair the wiring yourself or contact us to arrange for an engineer to visit your home. If the fault is found to be with a piece of equipment that's connected to your phone line, or is something you have caused, you will be charged for this visit. If there is a fault on your phone line, there will be no charge. Voicemail doesn't respond to any commands such as delete or save. If the telephone does not have tone dialling or is set to tone dialling and is still not accepting the request, please try using another telephone. If you have access to a mobile or to another line, dial your own phone number and leave a test message. Then check 1571 and delete the test message. This usually removes the stuttered dial tone. If the problem continues, please contact our Faults Department. Contact our Faults Department on the number below as there may be a fault with your local telephone exchange. If you have access to a mobile or another line, make a test call to confirm that the problem still exists. Dial 1571, select option 2, then option 3 to check if the number of rings is at 0. If this is the case change the number of rings to a suitable amount. Disconnect all your equipment from the main phone socket and try another phone as your equipment may be faulty. If everything appears OK but Call Minder is still answering without the phone ringing please contact our Faults Department on the number below. Your PIN needs to be four digits and you cannot use the same four numbers or consecutive numbers, e.g., 1111, 1234. How do I report a phone or broadband fault? If you're still having problems after exhausting all our troubleshooting advice, please contact our fault team on 0870 087 8777*. Select 3 for technical questions, set up and faults and then select option 1 for landline faults or option 2 for broadband faults. Our opening hours are 8am to 10pm Monday to Sunday and 9am to 6pm on bank holidays. Please see contact us for further ways to get in touch with us. Note: This number is for fault reports only. Our agents are trained to answer your questions about faults or problems with your line, and will not be able to help with any other TalkTalk enquiries you may have. A TalkTalk Representative with run through some tests with you and ask you a series of questions to establish whether or not you have a fault. They may need to raise the fault with a third party such as BT or one of our network providers. We will endeavour to contact you within two working days of reporting the fault with an update. Please note that if we have to send an engineer to your property you may incur a charge. See our Broadband Terms & Conditions for details. * Calls to this number are free from your TalkTalk landline. View More: TalkTalk How do I report a phone or broadband fault? My Caller Display isn't working. What should I do? If the caller has decided to withhold their number, it will not be displayed on your telephone. Try calling your landline from your mobile phone, or another number that you know is not withheld and check if the number is displayed. If the number is displayed, then your Caller Display is working correctly and the other caller may have withheld their number. If you have a second phone that also has a caller display unit, try using this phone to check if the Caller Display is working. If it works on that telephone then there may be a problem with the first phone. Disconnect all telephony equipment from your phone line, for example phones, fax machines, microfilters, Sky digital, modems and so on. Call your landline number from a mobile phone and check if the number is displayed on your caller display unit. If the number is displayed, then some of your other equipment might be the cause of the problem. Reconnect your equipment one-by-one and check your Caller Display after each one is reconnected. If the Caller Display stops working at any point, then the last item you plugged in may be the source of the problem. If you still have problems after trying these steps, please make a note of the make and model of your phone or call display unit and call us on 0870 087 8777*. * This number is free of charge when dialled from your TalkTalk landline. View More: TalkTalk My Caller Display isn't working. What should I do? What is a master phone socket? 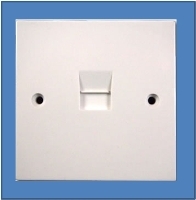 The master phone socket is a white, square-shaped socket made up of two parts - one on top of the other. The bottom part is removable and has two screws on either side of it. The top part usually has a BT logo on it. The master socket is usually found at the point where your phone line first enters your home. This is most commonly found in the hallway. You should filter this socket using a microfilter and ensure that any other phone sockets that are in use are also filtered. Sometimes the master phone socket already has a microfilter built into it. If this is the case, your master socket will have two ports, one for broadband and another for your telephone. If you have this type of socket you don't need to use any microfilters. View More: TalkTalk What is a master phone socket? If you're having problems with your phone there are some simple checks you can do to try to find out what's wrong. If your landline appears to be dead or your broadband is not working at all, it may be a general problem that we are already aware of. Check the status of our services. You should always undertake a line test on bt.com before completing any further tests. If this does not identify your problem you need to complete extra tests using your phone socket. Before you start testing you must check what type of phone socket you have got. Please, click the images to be taken to relevant advice. Here you can check if the internet and telephone network is OK in your area. This list of known issues and planned engineering works is updated regularly. Click on a message title to see details. If a broadband problem affecting your area has only recently been resolved, you may still need torestart your modem or router to restore your broadband service. There are a few simple checks you can make to test if you've got a problem with your line box socket. Please find here a step-by-step guide to checking for faults. 1. Remove the 2 small screws on the faceplate (see Figure A). 2. Carefully take out the bottom half of the socket. 3. On the right hand side you should now be able to see the test socket. 4. Plug a corded phone you know works properly into the test socket (see Fig B). 5. If the phone works normally then your internal wiring or equipment is faulty. Try to find out where the fault is located by checking each piece of equipment in your property by plugging it into the test socket. If each piece of equipment works when plugged into the test socket, reattach the face plate and try a corded phone in each extension in the property. If you find a faulty extension, you can contact BT on 0800 800150 or a local electrician to fix the problem. You will be charged for this repair. Double check the problem is likely to be with your line by plugging another corded phone into the test socket. Unplug anything connected to the sockets within your house before testing to make sure nothing is interfering with the master socket. This includes house alarms, telephones, faxes, computers, satellite TV digital boxes, adaptors and double adaptors. Test your master socket with a corded phone which you know works properly. If the corded phone works when plugged into the master socket then it's likely the cause of the fault is a piece of equipment or your internal wiring and the BT Network is okay. To try to find the fault, plug each of your devices in, one at a time, and check the line again sfter each piece of equipment is added. If you find plugging in one particular piece of equipment causes the problem to reoccur, unplug it and consult the user manual it was supplied with or contact the manufacturer. If each piece of equipment works correctly try plugging a corded phone into each extension. If you find a faulty extension you can contact BT on 0800 800150 or a local electrician to fix this problem. You will be charged for this repair. Double check the problem is probably with your line by plugging another corded phone into the test socket. Remove the cable tie from the top right hand corner and the screw from the top left. Open the box and remove the yellow plug. You'll need to run a second line test on www.bt.com/faults or by using our automated line test system on 0800 800151 if you haven't already done this. If you identify a fault with the BT Network then you can log your fault online. If the line never worked it is recommended you contact your housing developer before taking any further action to make sure the line has been fully connected. To try to identify the fault yourself try plugging each piece of equipment into the socket, one at a time, checking the line again after each device you add. If you find that plugging in one particular piece of equipment causes the problem to happen again, unplug it and consult its user manual or contact the manufacturer. If you don't find a problem with any piece of equipment reattach the face plate and try a corded phone in each extension. If you find a faulty extension contact BT on 0800 800150 or a local electrician to fix the problem. You'll be charged for this repair. Do you have the same problem with all your telephones? If only one of them is affected, it’s probably a fault with that connection or handset. Do you use another supplier for your phone calls? If so, dial out using the prefix 1280 (this will route your call via our network, so you will be charged at the normal BT rate). If the call connects, the problem is probably with your call provider’s network – so you need to contact them to have it fixed. If nothing previously mentioned has resolved the issue, you can carry out a thorough test to identify the problem. Are all your phones on the hook and ready to receive calls? If nothing previously mentioned solves your problem, you can carry out a thorough test to ascertain whether there is a fault on your line. Manage your BT line problems. Troubleshoot issues, report and track faults. Experiencing problems with your BT service? Do I have to pay for an engineer’s visit? The charge of £130 includes the engineer driving to your home, all the time fixing the fault and any replacement equipment used. Most chargeable engineer visits are caused by faults inside your home but you could also be charged for faults within the boundary of your home. It's much more common that charges apply when a fault is within your home. The picture below shows a range of devices and wiring that could lead to your phone line not working. You could be charged for an engineer visit if your main or master socket, extension wires or wires leading up to the main socket are faulty. It’s essential that they are looked after by keeping them kept dry and undamaged. View More: BT Do I have to pay for an engineer’s visit?